Susan Gillis, curator of the Boca Raton Historical Society, and the late Donald Curl, an original faculty member at Florida Atlantic University and Addison Mizner expert, compiled a list of trivia to put to rest what they called “much malarkey” that has been published in Alva Johnston’s The Legendary Mizners and Theodore Pratt’s The Story of Boca Raton about the noted Boca Raton architect and planner. “When they believed the facts interfered with an interesting tale, the facts suffered,” Curl wrote. Myth 1: Addison Mizner was an untrained and reactionary architect with a soiled reputation within the architectural community. Reality: He didn’t go to an architecture school, but he trained as an apprentice, which was the custom at the time. Mizner was recognized by fellow architects and was featured in respected architectural publications. Myth 2: Mizner designed the historic section of the Boca Resort & Club, known as the Cloister. Reality: Although Mizner designed the two historic sections of the hotel, the easternmost section and the Boca Raton Club were commissioned by second owner Clarence Geist who hired New York architects Schultze and Weaver. Myth 3: The main lobby and courtyard of the Boca Resort & Club were designed by Mizner. Reality: Schultze and Weaver designed them. Myth 4: The columns of the Cloister Inn look top heavy because they were installed upside down. Reality: Not true. They are Gothic style. Myth 5: Mizner found the “slave girl” sculpture, which sits in the center of the main courtyard at the Boca Resort, in a Tuscan town. Reality: The fountain, which Mizner probably never saw, was part of a 1929 Schultze & Weaver addition. 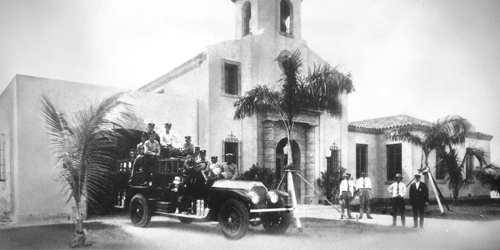 Myth 6: Mizner was the “inventor” of Boca Raton. Reality: Boca was founded in the 1890s as a small farming community. The Town Council appointed Mizner city planner and he put Boca on the map. Myth 7: Mizner forgot to put kitchens in his designs for the homes in Old Floresta. Reality: All of the 10 original models were designed with kitchens.